Stuffed animal food. Animals need a measured cup in the morning and their second cup in the afternoon. It was one of the ways math was seamlessly integrated into the Stuffed Animal Day Care. The stuffed animal morning responsibilities are in addition to other morning responsibilities (signing in their name, daily graph, etc). 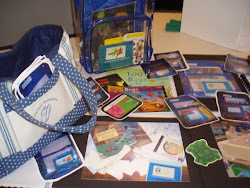 This resulted in enhanced print awareness and the building of fine motor skills by signing in two names each morning! This is a nice model for units of study How to Writing genre. 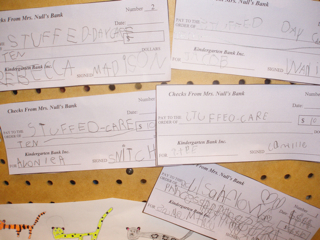 I made some checks so students could pay for their day care each week. They had to write the name of the day care, the amount, and write their own name too. 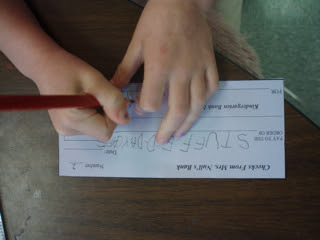 Some kids tried a "cursive signature". Stuffed Animal Day Care Corner (notices, art work, sign in, checks, photo/name stuffed animal book). A stuffed bunny's mom shows her a photo she drew for her. Tiger got a book to look out while his parent does her morning work. I love watching the children pick out books for them. Stuffed animals taking a nap after a busy morning. They kennel up when they have breakfast and lunch served to them. 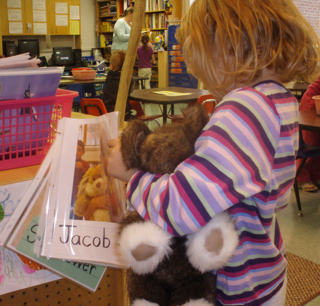 This Stuffed animal is nurtured and read too. 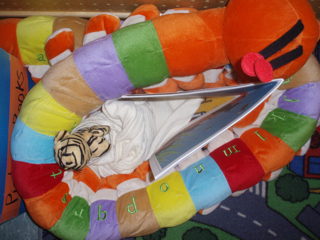 A child looks through the photo album of stuffed animals learning how to spell all their names by using this "word wall book" as a writing resource. They also learn to read their friend's names. A record of growth over time for student's handwriting and spelling understanding. 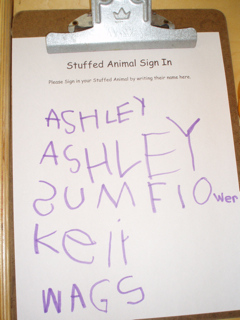 Students started to write about their stuffed animals. Writers of all ages and skill do their best work when they have meaningful and self driven reasons to write. 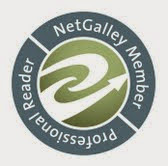 When things are meaningful, risk taking improves, and that is how writers get better. This student is stringing letters, showing the understanding that a group of letters represent a word and that text under and illustration helps tell the story. Make checks payable to Stuffed Daycare. Thanks Cynthia! That was so much fun that year. Such tender care givers in that group.